Replacement filter foams and spare parts for the Oase BioPress and FiltoClear pressurised pond filters. Spare gasket sets and UV lamps. Water Garden offer a wide range of spare and replacement parts for the OASE FiltoClear and BioPress Pressurised Pond Filters. The FiltoClear Filter Foam Sets feature plastic end parts and all coarse blue and fine red filter foams that the specific filter model contains. Maintenance Sets contain filter foam sets, replacement UV lamp and all replacement rubber gaskets for the filter. Spare OASE UV lamps are available to suit all models of FiltoClear and BioPress pond filter. Genuine OASE spares and consumables for the BioPress 4000, 6000 and 10000 and the OASE FiltoClear 3000, 6000, 11000, 12000, 15000, 16000, 20000 and 30000 models. 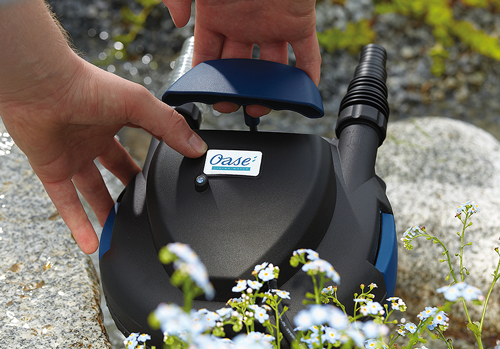 The OASE BioPress and FiltoClear pressurised pond filters offer superb cleaning performance in ponds and water features when correctly maintained. There are a few things you should check to ensure your filter is operating at its most effective. Both the OASE BioPress and FiltoClear require the UV bulb to be changed once every year and we recommend that this is replaced in the early spring to ensure the best performance during the warmer seasons ahead. Check the filter sponges are not deteriorated (i.e. flaky or crumbly) and also that the foams are not squashed or distorted inside the filter. If the foams are damaged, we recommend new OASE foams for guaranteed performance. Check the UV Quartz Sleeve (the glass tube which covers the UV lamp) for any signs of moisture inside the glass. If this is spotted early, it is unlikely that any damage to the sensitive electronics within the ballast unit will occur. Clean the quartz tube and replace the rubber O-ring seal to prevent moisture entering beyond the glass sleeve. In very rare occasions, water may have reached inside the quartz and this may result in a failed ballast unit and is likely to require replacing. We stock OASE FiltoClear and BioPress UV Ballast Units to ensure fast delivery to get your filter back in operation.